Once our truck loaded with scrap tires arrives at our tire processing facility, the truck is then weighed at the scales. The truck proceeds to the BDS processing facility where the tires are unloaded manually or via a walking floor trailer. The empty truck proceeds back to the truck scales where the tire weight is calculated and the weight slip is generated. Once unloaded the tires are segregated into four separate categories. Tires without rims and tires small enough to be shredded whole are fed directly into the shredder with a hydraulic excavator. Tires with rims are placed in a pile to have the rims removed with an excavator-mounted shear. The de-rimmed tires are then placed in a pile where they are fed directly into the shredder. Steel and aluminum rims are recycled as scrap metal. 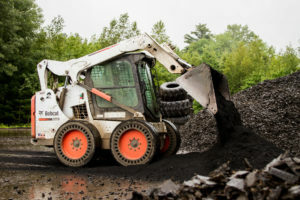 Oversized tires are placed in a pile to be periodically sheared by a hydraulic excavator into pieces small enough to be fed into the shredder. These pieces are fed directly into the shredder. Once the tires are shredded the shreds are conveyed over a classifier that classifies the shreds into 6″ minus and 6″ & over. The 6″ & over are recirculated back into the shredder and continue in this process until the shreds are small enough to pass through the classifier as a Type B chip. The Type B chips are then conveyed into a finished Type B chip stockpile. How are Type B chips used? The Type B chip is used in the construction of new landfill cells as a drainage layer allowing leachate to drain to the collection pipes and as a protective layer protecting the landfill liner from being punctured by landfilled waste. The Type B chip is also used in civil engineering applications. Such projects include light-weight fill material for road construction and bridge abutments. The Type B chip can also be processed into tire-derived fuel (TDF). The chips are fed into an 1 1/2″ TDF processing system that creates 1 1/2″ TDF. Bead wire is magnetically removed from the 1 1/2″ TDF. TDF is used by paper mills to create steam which is used to produce electricity.